Poland is known for its top class education system thus overseas students come here all over the world. 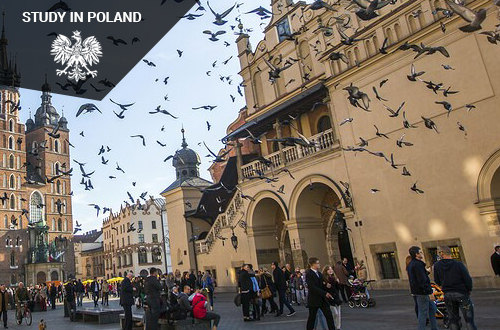 Poland is attractive and affordable option to study abroad. Study in Poland is a big advantage as it gives you a European qualification recognised all over the world and that also at a very low cost tuition fees. The cost of Living in Poland is also reasonable As Poland is a member of European Union the passport checks on Poland’s borders are abolished. International students in Poland can work for 20 hours per week. They can work full time for 3 months during holidays. You must be enrolled in a full time course in a Polish institution. International students who have completed full time study in Poland can work in Poland. You can apply for a temporary resident card valid for 1 year. Student will get offer letter within 5-7 working days. Once student receives offer letter, he or she has to pay the University tuition fees directly to the university account as mentioned in the offer letter. After paying the tuition fees, student receives the final Invitation Letter. In Poland, tuition free depends on international students’ choice of institution whether they are planning to study in a Public or Private institutions. The minimum tuition fee is 1600 EURO to maximum 4000 EURO per year varies upon the program. The estimated Living Cost in Poland is 350 to 750 EURO in a month, however they can opt rented house along with friends, home stay as per their budget. Poland is known for its quality education, it is a member of European Union Member (28 countries). The visa allows you to travel to 26 members countries. Students can take a transfer to study in an EU country. After graduation, they are allowed for extended residence. A curriculum is designed following International standards and courses tech in the English language. Students can save their one year in engineering (Bachelor for 3 years and Masters for 1.5 years to 2 years) No TOFEL, IELTS required if education has been in the English language. Various scholarship programs are conducted by Poland government to facilitate overseas students. Students are allowed to do part time job and internships as well. Make your future bright while studying in Poland’s top education institute by approaching West Highlander. We offer reasonable processing charges and we have a strong collaboration with prominent Universities and Colleges in Poland. We prefer to give one to one counseling to students. We provide complete admission and visa process services. The processing fee is free for a dependent application. West Highlander is a fastest growing immigration consultancy in Chandigarh specialized in providing student visa for Europe (Poland) from last twelve years. We have a team of experts who can make your dreams come true of studying Poland. Parwinder Kaur, one of the key persons of West Highlander who holds a strong experience of this industry. She is Education UK certified Counselor and ICEF Trained Agent Counselor and member of NASFA. We are also an ICEF Accredited Agency. West Highlander is the best consultant in Chandigarh, making your process of study abroad smoother and faster in given time frame.